Sometimes I let November get me down. It’s cold. It’s dark. The wind makes my ears hurt. All the glorious colors of the growing season have gone by–or have they? All it takes is a walk through Blithewold to perk my spirits back up again. 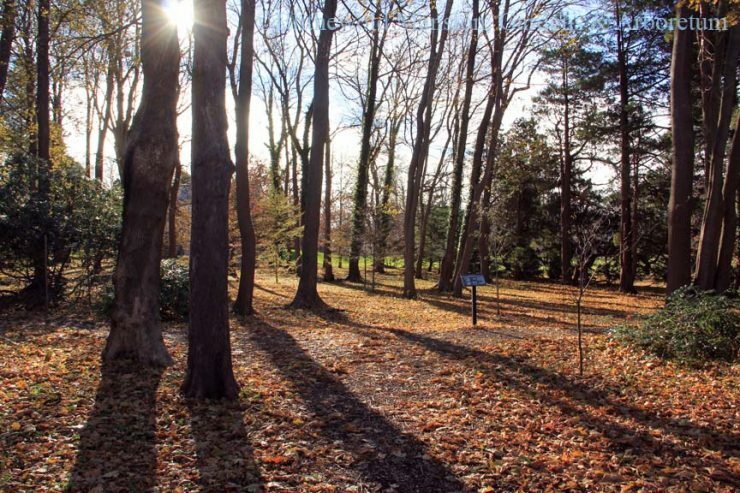 The way the light plays through the bare trees in the Bosquet makes me remember that there is beauty even now. Taking a turn out of the Bosquet, I wander down the Shrub Walk and see the Viburnums, with their leaves still hanging on, full of fruit. The birds will be pleased. The earth was much too mushy to get a close-up of the fruit, but luckily I spotted them from the path. Viburnum fruit is a wonderful source of nutrition to support wildlife in the colder months. Not far from here is the bright color I’ve been searching for on a gray day – the Common Witch-Hazel (Hamamelis virginiana). This yellow is so cheerful that it totally brightened my day. 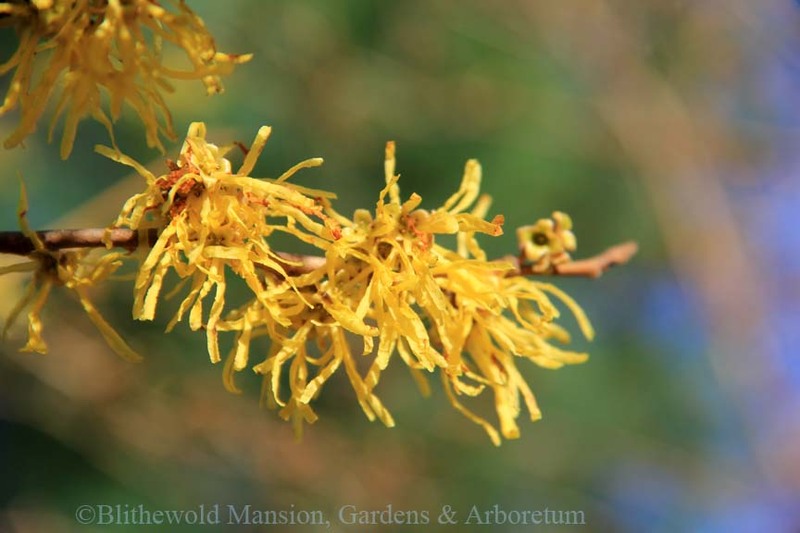 And what strange flowers the witch-hazels have! 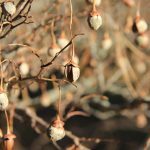 Michael Dirr describes the bizarre blooms as having “strap-like, crumpled petals.” Never have I been more pleased to see a crumpled flower. Not only are they unusual, but they are fragrant, too. These flowers are definitely worth a closer sniff. 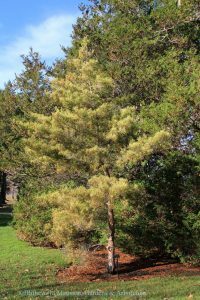 Another golden plant catches my eye nearby – Dragon’s-eye Japanese Pine (Pinus densiflora ‘Oculus Draconis’). 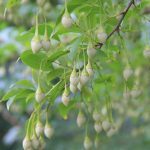 With a cultivar name reminiscent of a spell from Harry Potter, this fetching tree stands out from the crowd. Though the specimen here at Blithewold is diminutive in size, the stunning color more than makes up for it. 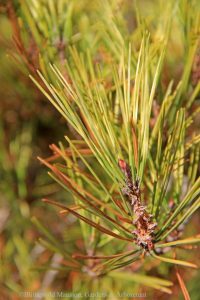 This lovely Pine is very slowly growing (about 6″/year), but can eventually reach a height of 30′. I hope to see this tree reach its full potential one day. 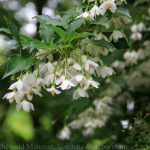 On the other side of the path is the always lovely Japanese Snowbell (Styrax japonicus). The flowers on this tree always capture my attention in May and June. Even when we are going great gusto in the main garden areas, I find a way to sneak down the Shrub Walk for a peak at this great beauty. From flowers in June to fruit in October to seeds in November, everything happens in its time. Seeing the photos lined up like this helps me to remember the cycle of the seasons. Every season has its purpose and contributes to the longevity of plant life year after year. 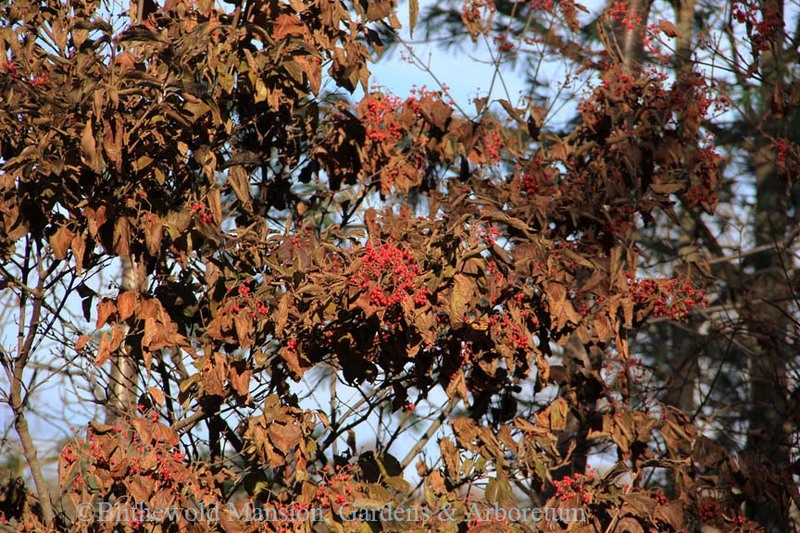 Thinking of fruit, the hollies in the Enclosed Gardens are full of berries this year! Gail was just remarking to me the other day how this seems to be the year of the holly berry. This fits well with the Christmas at Blithewold festivities. If you wander the Enclosed Garden during a Starlit Stroll night (Dec. 6, 13, 20, and 27) or at one of the Sparkle! events (Dec 14 and 21), you will see all the beautifully-crafted decorations and lights on display. During the day you will see these decorations along with the stunning holly berries currently in fruit. 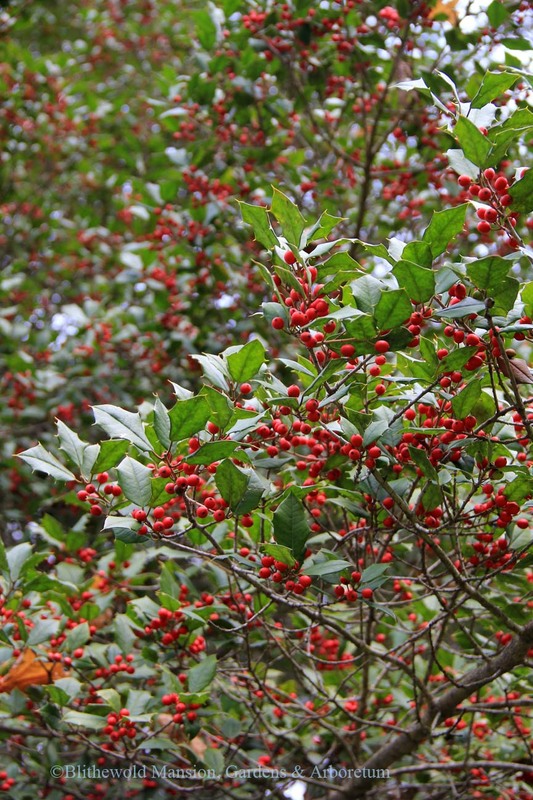 The American Holly (Ilex opaca) is putting on a particularly good show this year. Whenever you visit Blithewold, I hope you will find peace and brightened spirits here. A walk through a happy woodland is good for the soul any time of year.